I've just completed the rebuilt harmonic balancer installation, and replaced the drive belts. I discovered some useful information I wanted to share regarding the belts. Belt #1: Part #NNA4705AA can be described as 7PK1450. Belt #2: Part #EAC9898 can be described as 4PK1080. Belt #3: Part #NAC2211BA can be described as 5PK840. Where the digit before the PK is the number of ribs in the belt, and the number after the PK is the length of the belt in millimeters. I found ample supplies of belts 2 and 3, both genuine and aftermarket. Auto parts stores have these as well. There are some slight length differences to be seen, but typically a measurement within 10mm will fit. Autozone shows a 5PK825 for belt #3, not so sure about that one. Belt #1 is a different story. There are very few places that have this genuine belt new, and I found only one aftermarket type (from many online sellers) that was claimed to fit the car as belt #1. I bought one of these Continental belts on Ebay, only to discover as soon as I received it that it is incorrect. The size is 6PK1440. So it is a 6-rib belt, not a 7-rib. The 10mm shorter length would "probably" be ok, but I rejected it right away as a 6-rib and did not test fit it. Not a single online listing (of many) for this particular Continental belt described it as a 6PK1440. Ironically the sleeve it came in is printed with the size! I returned it and then spent about twice the money on the correct genuine belt. The genuine Jaguar belt is the only one that fits. I was confused at first during my searching for this belt because the belt that came off the car was a genuine Jaguar EBC1500. That is where I started searching. This belt measured as a 7PK1470. 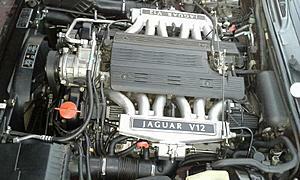 Then I discovered the EBC1500 is meant for the 1994 (USA) XJ12 (XJ81). Listings are plentiful for this genuine belt and aftermarkets are available too, as it is used on a few other vehicles. It is relatively inexpensive. I realized at some point that I had a lot of trouble getting the tension correct on the old belt (the EBC1500), that it was hard to find a good position for the idler pulley tensioner. It had to be positioned close to the compressor pulley to get adequate tension. This made the angle of the belt over the idler different than the picture shows. When I nailed down the length of the correct genuine belt, it all made sense. With the new genuine belt installed, it was easy to get good tension, and the angle the belt makes around the idler is just like the diagram. Problem solved. The genuine Jaguar EBC1500 is a 7-rib belt but it is too long. The Continental aftermarket belt is only a 6-rib but "probably" ok lengthwise. But the genuine Jaguar NNA4705AA is my hero. It is Juuuuuust right! I'll see if I can answer my own question with some research, but curious if the 1994 XJ40/81 V12 uses the same belts and thus your tips apply? I'm about to buy all new belts if I have to rebuild the harmonic balancer on my 1994 XJ12, so this is timely info. The large belt for the A/C and P/S (belt #1 above) for your XJ81 is the EBC1500. The other two belts are the same as the X305. My car had a EBC1500 on it but it didn't fit very well. It was a bit too long. I'm not certain what the difference in length is attributed to, but the compressor pulley might be different (slightly larger) on your car. What technique/specifications are you using to properly tension the belts? I have table of tensions for the AJ16 belts, so I assume there is one for the V12 somewhere. Regarding the power steering / AC belt (NAC2211BA): I found that Continental produces a 7PK1440 belt with the part number 4070567. I just used this as a replacement on my 1995 XJ12, and it fits perfectly. Currently $18 on RockAuto. Good and relevant info as always on here! Wish I'd discovered that belt back then. I see it on the Rock now. Oddly, even the Rock doesn't list this belt for the XJ12, and there is no information about it's size at all on their site. I suppose its size and part number would first have to be identified elsewhere somehow. To be clear, we are talking about the large A/C and power steering belt, NNA4705AA. I LIKE your post, cmb, but I also want to THANK you for it. I suppose we must spell it out now, since the THANKS button has been replaced. To me, giving likes doesn't mean much. I'd rather give thanks when something useful and interesting happens. This isn't Bookface. There is a funny thread about the change in the Feedback/Suggestion section. When to change drive belts?